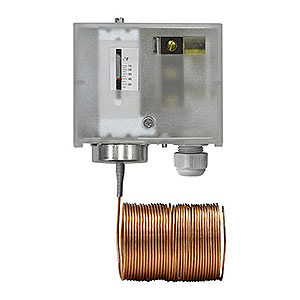 Electro-mechanical, low-temperature limit/cut-out thermostat with a 20 ft, 10 ft or 6 ft capillary sensing element, auto- or manual reset, and 1-SPDT	or 2-SPDT switched output. The thermostat and its capillary sensing element provide an antifreeze function. It detects temperature drops below a fixed safety value (setpoint), i.e. heaters in A/C units, exchangers in cooling systems, etc. Capillary overload temperature 392�F (200�C), max. 60 min.